It was Christmas Eve 1968. And the astronauts of Apollo 8 - Commander Frank Borman, Jim Lovell, and Bill Anders - were participants in a mission that took them faster (24,000 mph) and farther from the Earth (240,000 miles) than any human had ever traveled. Apollo 8 was the mission that broke humanity's absolute bond to the Earth: it was the first manned vehicle to leave the Earth's orbit. Confined within a tiny spaceship, the astronauts were aided in their journey by a computer less powerful than one of today's handheld calculators. Their mission was not only a triumph of engineering, but also an enduring moment in history. The words these three men spoke from lunar orbit reverberated through American society, changing our culture in ways no one predicted. A very interesting history of the Apollo era of the Race for Space, focusing on the crew of the Apollo 8 and their families, but including a some details on some people in the post Apollo space program. There was a good mix of detail on the crew and the Apollo program itself with background details of the social and historical context of the time which would be especially useful for anyone who didn't live through them. 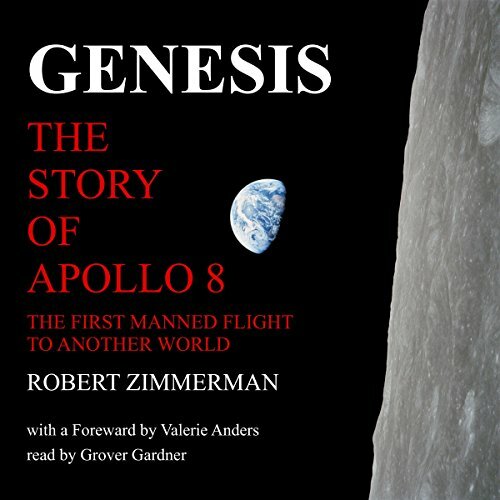 There is a good effort to provide the human angle to the story and to personalize the story of the crew of Apollo 8 and their families, but there are occasional anecdotes which are fairly banal and could have been edited out. Grover Gardner was the ideal choice to narrate this book. He is able to reproduce the tone of a 1960's TV anchorman perfectly, which really helps situate you in the period of the book. Excellent job!